Healthcare spending in the U.S. is unsustainable. Therefore, for healthcare reform to work, someone—patients, doctors, hospitals—is going to have to give up something. That painful process seems to be underway now in Arizona. Accounts differed as to whether the protesters ignored warnings not to walk on the bridge roadway or were lured by police and then arrested, or a little of both. But the arrests put the New York City protests on the world’s front pages for the first time. Last week, NPQ covered new calls to rein in Wall Street speculation while raising revenue. We reported on nonprofits finding new and innovative crowdsourcing methods to gether info about crumbling infrastructure or generate ideas to stem water pollution. And we met a couple of teenage girls who have successfully taken their anti-palm-oil campaign all the way to the top of the Girl Scouts’ cookie-selling operation. All this and more in NPQ’s Week in Review. The first half of 2011 saw the continuation of charitable giving trends that have been established for some time: The average gift per donor is getting larger, but this growth is not enough to offset the declining total number of donors. 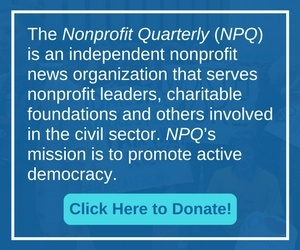 Last week, NPQ covered a disturbing story out of a Johns Hopkins-affiliated research institute regarding the deliberate exposure of children to lead dust, a more uplifting example of taking lemons and making “lemon-aid” provided by an Oregon chapter of Habitat for Humanity, and President Obama’s new proposal to implement the “Buffett Rule” to insure that investment managers and others making more than $1 million per year pay a higher tax rate than middle-class families. All this and more in NPQ’s Week in Review. Liberal grassroots organization MoveOn is trying to build support for a federal jobs program by asking members to send in photos of infrastructure projects that need doing: dilapidated bridges, obsolete park structures, dangerous highways, inadequate transit facilities. At a time when the public is deeply distrustful of institutions, do accountability measures actually undermine public confidence? Like City Year co-founder Alan Khazei, Harvard Professor Elizabeth Warren is closely connected to a nonprofit organization while running to be the next Senator from Massachusetts. But there are some key differences in their situations. President Obama likes it, Rep. Paul Ryan (R-Wisconsin) likes it, and both The National Review and Jesse Jackson like it. So why doesn’t the state official who runs GeorgiaWork$ like it? Among those who express a preference, both men and women prefer to work for men rather than women, but the gap is shrinking. A plurality of U.S. workers have no preference.